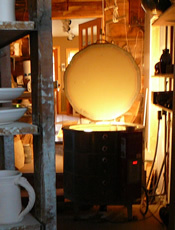 We often get questions about our pottery and how it is made. We've listed a bit of information here that might help give you a idea of how stoneware is created and how different glaze types are achieved. Stoneware is a category of clay and a type of ceramics distinguished primarily by its firing and maturation temperature of about 2400 degrees. In essence, it is man-made stone. It is a strong opaque ceramic ware that is high-fired, well vitrified, and nonporous this makes it very functional and durable. 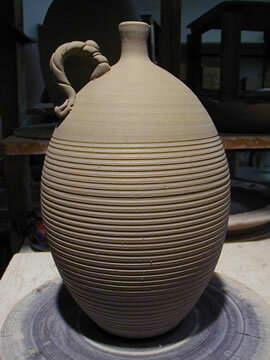 It is usually colored grey or brownish because of impurities in the clay and is normally glazed. All stoneware at Canyon Creek Pottery is microwave and dishwasher safe. Raku is a decorative pottery that is fired to a lower temperature and while the pieces are still glowing red hot they are placed in a reduction chamber full of a combustible material such as sawdust or pine needles. The burning material in the chamber reacts with the glaze to make flashes of copper and the thermal shock creates patterns of crackle. 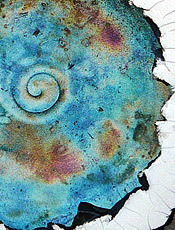 Together these effects make for some very beautiful pottery.